In the meantime, the NOCH Laser-Cut minis kits range has become huge! In spite of this, every year it occurs to us that one or more details may have been missed out. With the »new ones« 2018 you can decorate your landscape and create, for example, mountain pastures, emphasizing the features or designing a particular scene. Have fun creating! 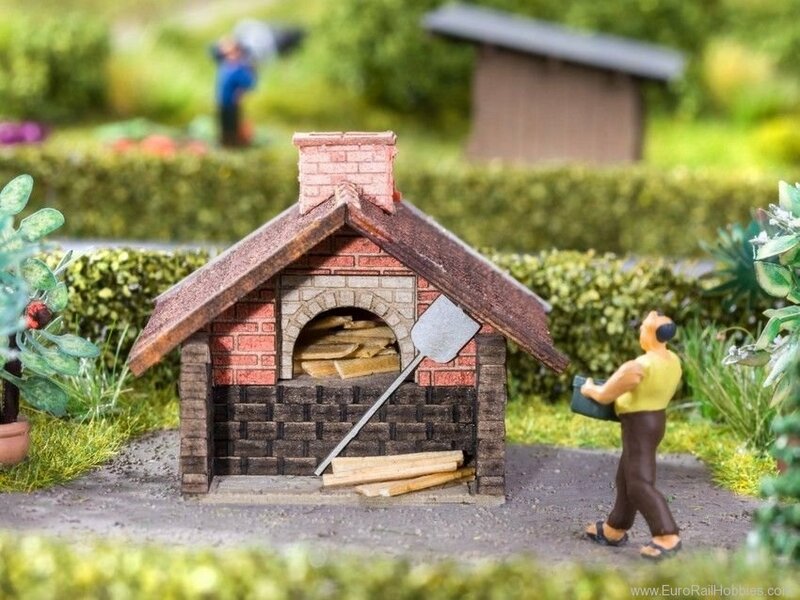 The little bakery made by NOCH will be a highlight on your model railway layout. The small kit is very realistic and the scene can be ideally created with complimentary accessories such as the Figures Set »Bakers« (ref. 15053). A bakery, also a communal oven, is a simple functional building. The inside of the oven has been built of oven rock. In villages, use of a communal oven was widespread until the 1960's and regular baking days saved a baker, your own oven and energy for the villagers. Additionally, baking day was an important way to interact and socialize within the community. While baking bread and cakes, the villagers could exchange news and gossip! Another reason for establishing baking houses was the intention to minimize the danger of fire caused by baking in individual households. Beside the bakery, there have sometimes also been side rooms in which preparation and additional works could be undertaken. The ovens were fired with locally available heating material, mostly brushwood and wood. Before putting in the items, the oven was pre-heated and later on, the subsequent glow was extinguished (source: Wikipedia).